What Are the Most Scream-Worthy Rides at the Parks? If it's thrills—and only thrills—you're after in Southern California, you'd probably want to head to Six Flags Magic Mountain or Knott's Berry Farm. Unlike "iron parks" such as Six Flags, which are largely all about scaring the Bermuda shorts off of its guests with its white-knuckle rides, Disney's more toned-down thrills typically contribute to an attraction's overall, highly themed story. But that doesn't mean that the parks at the Disneyland resort are devoid of thrills. Let's take a look, in reverse order, at the ten most thrilling rides (plus one honorable mention) among the resort's two parks. There aren't any huge hills or other coaster-like thrills, but the groundbreaking Enhanced Motion Vehicles on the groundbreaking Indiana Jones Adventure are quite zippy, and the action-packed ride is filled with sudden stops, starts, and jostling to and fro. The psychological thrills, including dimly lit scenes and "poisonous darts," add to the scare factor. The first half of Radiator Springs Racers is quite tame. But the slot car-like vehicles really pour it on for the outdoor racing finale. There are even some mild airtime moments as the cars zoom over a couple of bunny hop hills. Goofy's Sky School is one of the few attractions at the Disneyland Resort that actually is like a ride typically found at an amusement park. The Wild Mouse-style coaster reaches a fairly tame 27 mph, and the hills aren't all that steep. But the hairpin turns nonetheless deliver some scream-inducing moments—especially for younger riders. A big-budget tour-de-force-be-with-you, Star Tours will knock your socks off more with its highly impressive 3D imagery, random sequence generator, and other cool effects than with its thrills. But the motion-simulated free fall, hyper-speed, and other sensations are thrilling in their own right. Really more wet than thrilling, the drop finale can be disconcerting to the thrill-averse. It's not as steep or as long a drop as Splash Mountain, but it's a drop nonetheless. The animatronics and themeing are stunning. The music is joyful. But, because riders know there is a big drop coming, there is an ominous patina of dread that permeates Splash Mountain. And at five stories tall, reaching a top speed of about 40 mph at a 45-degree angle, it's a pretty decent drop. One of Disneyland's famous mountain rides, the Old West-themed coaster offers what would appear to be a runaway mine car ride that's loaded with thrills. But looks can be deceiving. How fast do you think Big Thunder reaches for its top speed? Would you be surprised if we told you it's 28 mph? Combine its relatively wimpy speed, its tame drops, and its almost non-existent airtime, and it's clear that the Disney classic is solidly in the "family coaster" category. It's in the same wimpy speed/tame drops/no airtime territory as Big Thunder. Matterhorn holds a special place in roller coaster history for being the first tubular steel track ride. Subsequent thrill machines have gone on to much greater heights (literally) as well as speeds, and features such as inversions have added new dimensions for ride designers and park fans to explore. None of the steel coaster innovations we now enjoy would have been possible without the Matterhorn prototype, but the original steelie is fairly mild (although its ride can be a bit rough and uncomfortable). It is arguably the most famous indoor roller coaster (and one of the most famous—and popular—roller coasters of any kind for that matter). Space Mountain offers more psychological than kinetic thrills, but a 2005 redesign made the ride much smoother and the entire experience more of a cohesive romp through the cosmos. It clocks in at a somewhat faster 30 mph than the other Disneyland mountain coasters, but it is still pretty slow by coaster standards. Because it is enclosed, quite dark, and includes some nifty effects, it feels much faster. Note that Disneyland sometimes re-themes the ride as Hyperspace Mountain and adds a Star Wars overlay as well as Ghost Galaxy with a Halloween theme. Neither makeover doesn't do anything to ramp up the thrills, but they do punch up the storytelling and overall experience of the iconic attraction. Coaster fans would classify Incredicoaster as a family coaster, which would theoretically make it suitable for riders of most ages (the height requirement automatically discounts younger children) and thrill tolerance levels. But let's be honest: It's at the upper extreme of the family category. 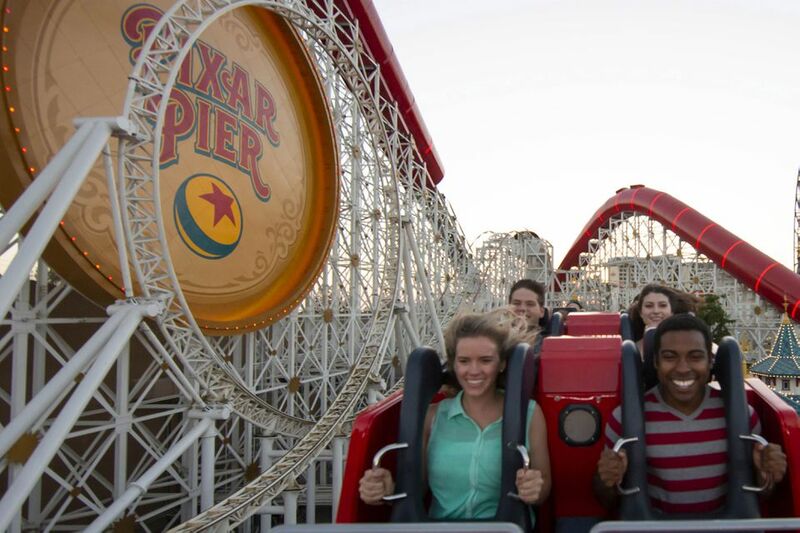 With a potent launch that accelerates riders from 0 to 55 mph in 4 seconds, a top speed of 55 mph, and a loop element that sends the train upside down, Incredicoaster is considerably more thrilling than its Disneyland coaster counterparts. Number 1: Guardians of the Galaxy–Mission BREAKOUT! The ride is essentially similar to tower rides found at many amusement parks, but the Guardians of the Galaxy themeing and music is spectacular, and its multiple drops and rises make for one unsettling and thrilling experience.